What counted as knowledge before the First World War? One of the questions that has been raised during the massive open on-line course (MOOC) on World War I: Changing Faces of Heroism that I am teaching on is the extent to which working class men would have had knowledge of ideas of classical heroism in the years before the war. A second-year PhD student here at the University of Leeds, Claire Martin, is working on the subject of the circulation of medical knowledge among working-class women in Yorkshire in this period. While not directly related to the First World War, Claire has kindly agreed to write a summary of some of the relevant historical discussions relating to the subject of class and education, demonstrating just how complex and important questions of class, culture and education are to our understanding of the era. If you ever read autobiographies and oral interviews of British working-class people who lived in the late nineteenth and early twentieth centuries, you might notice a somewhat unsettling recurring feature. Systematically, the authors or respondents insist on the ordinariness of their lives and experiences, as they are being recorded. They are telling you that their stories are not remarkable, that they are not important. They are surprised that anyone would be interested in them. Interestingly, you don’t tend to find such disclaimers in autobiographies left by their contemporaries of the upper classes. There the authors seem on the contrary quite confident in asserting who they are, and what they did. (Gagnier, 1991: p.13) When you compare the two, it feels as if at that time your social status determined whether or not your story was worth being told, or indeed whether or not you could claim to have a story to tell at all. As I was reading these stories, it became clear to me that class shaped these people’s conception of what and who was important and worth being remembered. In other words, class shaped people’s ideas of what counts as knowledge. To understand this, we need to look at the cultural context of Britain at that time. The second half of the nineteenth century was marked by a cultural revolution, inspired by the ideals of the enlightenment, and which promoted individualism. Free public libraries were opened throughout the country in an attempt to make knowledge accessible to all. In parallel, changes in education legislation meant that, by the 1870s, most people in the country were literate. The idea behind all this was to enable anyone, regardless of their background, to develop independent judgement. This was also a way to include people who had long been excluded from the traditional intellectual life by simultaneously enabling them to acquire knowledge and telling them that their stories and experience qualified as objects of knowledge too. (Joyce, 1999: p.39) Wonderful as it sounds on paper, however, the reality was quite different. The importance of education for all was increasingly recognised and access to it was certainly made easier, but working-class knowledge and experience were not so readily validated by contemporaries of the upper classes. During that period, the working classes remained the object of much contempt, more often than not described as a mass of uncultured, vulgar people by middle-class observers. They were not expected to think much or know their classics, if you will. The truth is, of course they did, but middle-class people would not recognise the validity of their cultural practices. One of the main reasons for this was because working-class culture was based on practices which were fundamentally at odds with middle-class ideology. There was a real cultural clash, a collision between two completely different approaches to knowledge and its transmission. In working-class communities, knowledge was traditionally transmitted orally: working-class people were culturally used to asking their relatives and peers for answers to their questions rather than to open a book. (Rose, 2001: p.220) Besides, knowledge was seen as something to be shared with the community, and not selfishly kept or pursued for one’s own interest. In opposition to this, people from the upper classes relied essentially on writings and academic accreditation, and completely dismissed informal practices and oral tradition. So on the one hand you had intellectual practices based on long-lasting traditions of orality and mutuality, and on the other hand an equally deep-rooted culture dominated by writings and individualism. British intellectual life at that time was suffused with middle-class values, and the imposition of this cultural model was institutionalised: schools for instance promoted competition, and individual learning and achievement. What counted as knowledge was entirely defined by bourgeois ideology, and working-class knowledge and cultural practices were dismissed. In his extensive study of British working-class intellectual life at that period, Jonathan Rose provides a fascinating account of working-class attitudes to knowledge and its transmission, and calls our attention to mutual improvement societies. In the second half of the nineteenth century, working-class people founded a number of cooperative education groups and mutual improvement societies based on their own cultural traditions. People would meet in various interest clubs, Sunday schools, and friendly societies, to listen to papers and debate ideas on a variety of topics – from politics to economics, literature, religion, history, or philosophy. (Rose, 2001: p.58) Cooperative education represented an alternative to dominant cultural practices and their middle-class bias. There was no hierarchy for instance, as you would find in a school with the teacher being the one who knows and speaks: everyone was on an equal footing. (Well, men were, that is – but that’s another story…) Considering that these people, owing to their social status, knew from experience the fundamentally oppressive nature of all hierarchies, this is hardly surprising. What this means for the social historian or indeed anyone interested in working-class culture at that time, is that we need to look beyond classical and institutional knowledge alone, and to be aware of the erasure of working-class knowledge and experience by bourgeois practices and ideology. Contemporary social commentaries will tell you what middle-class observers thought of working-class people. School curriculums will tell you what kind of knowledge was deemed important according to middle-class ideology. What working-class people knew or enjoyed, what they read, what they discussed, how they acquired and engaged with knowledge – all this is absent from such records; and just as working-class knowledge and cultural practices are dismissed, so too are working-class people. Good thing some of them decided to record their own stories and experiences, unremarkable as they thought they were. 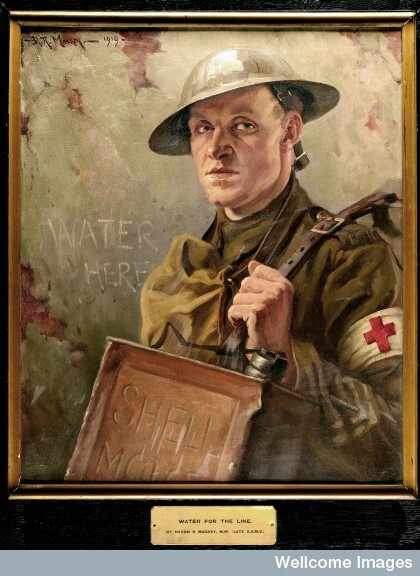 An image of an RAMC serviceman carrying water. This painting forms part of the small exhibition of images I have collated for the MOOC World War I: Changing Faces of Heroism which I am teaching on at the moment. If you would like to know more, please join the course at https://www.futurelearn.com/courses/ww1-heroism.